Called the island of Jesus Cristo in the period when it was being reconnoitred by the Portuguese navigators, its settlement was started in about 1450 when its captaincy was granted to a Flaming, Jácome de Bruges, by Prince Henry the Navigator. The first settlements were situated in the areas of Porto Judeu and Praia da Vitória, and soon spread all over the island. With an economy initially centred on agriculture, mainly the production of grains, and the export of woad (a dye-yielding plant), Terceira began to play an important part in navigation in the 15th and 16th centuries, as a port of call for the galleons bringing the wealth of the Americas and the ships engaged in the India trade. 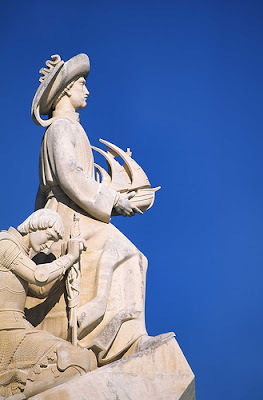 Henry the Navigator (1394-1460) - responsible for starting Portugal's maritime expansion. In that period Terceira was an emporium for the gold, silver, diamonds and spices brought from other continents, which attracted the covetousness of French, English and Flemish corsairs who constantly attacked its coast for several centuries. When Philip II of Spain took the Portuguese throne in 1580, Terceira supported the claims of the pretender, Dom Antonio, Prior do Crato, who even came to reside on the island and to coin money there, which led to Spanish attempts to conquer it. The first landing by Spanish troops, in 1581, was completely defeated in the famous battle of Salga, in which the writers Cervantes and Lopo de Vega took part. In 1583 much larger Spanish forces, commanded by Don Alvaro de Bazan, the victor of the battle of Lepanto, managed to dominate the island after violent fighting. Until 1640 Terceira was a port of call for the Spanish galleons filled with the fabulous wealth of Peru and Mexico. With the Restoration of Portugal's independence, line Spaniards were expelled and life returned to normal. The island kept its position as the economic, administrative and religious centre of the Azores until the early 19th century. The struggles that accompanied the introduction of liberalism led Terceira to play an important role in the history of Portugal once again. The island supported the liberal cause as from 1820. After various vicissitudes, there was a turn about in 1828 and the absolutists were dominated on Terceira which became the main base of the liberals. An absolutist attempt to land at Vila da Praia was defeated in 1829, and this was followed by the establishment of a liberal regency on Terceira and the later conquest of the other islands of the archipelago by the constitutional forces. And in 1832 it was from Terceira that the liberal expedition left for the landing at Mindelo in northern Portugal and the subsequent proclamation of the Constitutional Charter. The end of the l9th and the beginning of the 20th century were marked by a progressive reduction of Terceira's role in the life of the Azores. The construction of a port at Praia da Vitória, the existence of an important air base and a commercial airport have opened up new development perspectives for the island.